A Walk in the Park: Controversy Swirling Around Newtown Creek Boathouse - Public Funds Going To Build Private Hotel? Controversy Swirling Around Newtown Creek Boathouse - Public Funds Going To Build Private Hotel? The North Brooklyn Boat Club is proposing to build The Greenpoint Boathouse and Environmental Education Center at a new location owned by Broadway Stages in a building which will house a small private "hotel" for company employees. Broadway Stages president Gina Argento said she plans to split the cost of the entire hotel project, which will include about half a dozen hotel rooms, down the middle with the boathouse. Just how much is the boathouse supposed to cost now? 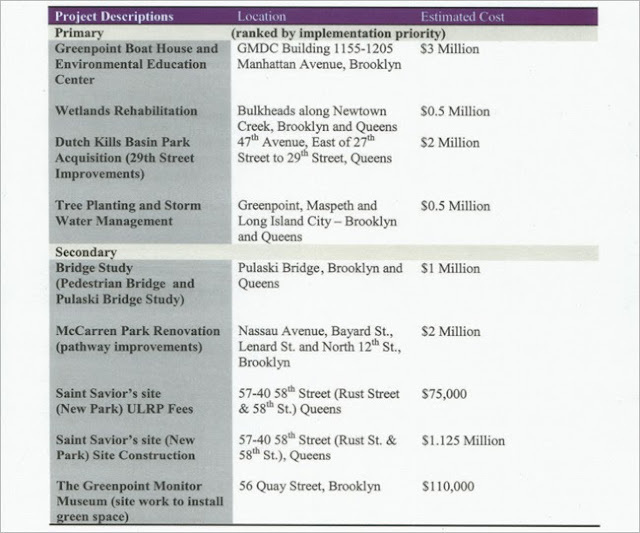 Queens Crap points out that the original cost estimate for the project was $ 3 million dollars which left more than half of the settlement for other projects. The City Parks Foundation (CPF) is overseeing $ 7 million dollars from the Newtown Creek Environmental Benefit Project Fund and is getting 10 % of the funds. It appears now that all of the funds could be used to build the controversial boathouse. The project was orignally approved at the site of the Greenpoint Manufacturing and Design Center at 1155 Manhattan Avenue but that deal quietly feel through. All projects were supposed to be off the ground by February 18th, 2014, within five years of the MOU, but that is happening. The City Parks Foundation has quietly asked for an extension of the deadline for the boathouse. "It is not fair that this project, which has been drastically altered from its original plans, gets an extension, while other projects which have been ready to go the entire time are told to continue waiting in line indefinitely," said Christina Wilkinson, head of the Newtown Historical Society. on a federal Superfund site. Three months later however State officials overruled the concerns of the two agencies responsible for public health and the environment and approved the $3-million boathouse and education center. In April 2010, the NY State DEC selected three organizations to administer Environmental Benefits Projects (EBP): City Parks Foundation (CPF) received $7 million; New York State Energy, Research and Development Authority (NYSERDA) received $2 million; and Hudson River Foundation (HRF) received $1 million. It's not just the pollution that stinks along Newtown Creek. Local activists are crying foul over what they say is a plan to use public money to build a boathouse inside a proposed four-story hotel at 51 Ash St. in Greenpoint, on the banks of the Superfund site, according to the New York Daily News. The Greenpoint Boathouse and Environmental Education Center, a volunteer group that sends canoes and kayaks down the waterway dividing Queens and Brooklyn, was awarded $3 million from the state in 2011. Not Happening. The project was approved for the site of the Greenpoint Manufacturing and Design Center at 1155 Manhattan Avenue. Apparently there were even some GWAAP board members who were not aware of the major changes to the project. “It’s beyond sketchy,” Geoffrey Croft, executive director of NYC Park Advocates, said of the plan to use public funds to help build a for-profit enterprise, which was selected in 2011 and recently turned up on two local blogs, Curbed and Queens Crap. The state awarded the money to the nonprofit boathouse in 2011, from a $10 million fine levied against the city for missing a deadline to improve the Newtown Creek Wastewater Treatment Plant. It was supposed to be based at the Greenpoint Manufacturing and Design Center, but the 250-member group couldn’t come to a lease agreement. Instead, it took up Broadway Stage’s offer to move into a series of shipping containers along the creek on land owned by the production facilities company. Broadway Stages is now seeking zoning approval to build a private hotel on the site that would also include a two-story boathouse and community center. “There’s absolutely no conflict of interest,” said Dewey Thompson, co-president of the North Brooklyn Boat Club. The club runs the boathouse at the mouth of the creek, near the East River. “The grant money is going specifically and only to building the community boathouse facility within the commercial structure,” he said. The North Brooklyn Boat Club in Greenpoint. State Department of Environmental Conservation officials also said the money will be used for the boathouse, not for the hotel, and said the City Parks Foundation requested an extension for the project completion deadline, which was to expire on Feb. 18. But Broadway Stages president Gina Argento told a different story, saying she plans to split the cost of the entire project, which will include about half a dozen hotel rooms, down the middle with the boathouse. “Nothing is final yet,” said Argento, who has also been identified as an investor in the controversial Knockdown Center event space in Maspeth. The City Parks Foundation would not comment. The city and state Health Departments and city Department of Environmental Protection did not return calls and emails. Local activists, however, say the plans should be re-evaluated. “The project that was approved is not what they are now proposing to do,” said Christina Wilkinson, president of the Newtown Historical Society. She also questioned the safety of boating on the polluted creek. “It’s ridiculous that a so-called environmental organization is promoting recreation on Newtown Creek,” she said. The waterway is one of the most polluted in the country, according to Environmental Protection Agency officials. In heavy rains, raw sewage and water ends up in the creek, said Queens College microbiologist Eli Dueker, who has studied the site. That’s in addition to the millions of gallons of oil that would up in the water. What's Going On With Greenpoint's Newtown Creek Boathouse?